2018 was a difficult year for cryptocurrencies, with wide-scale falls in value. 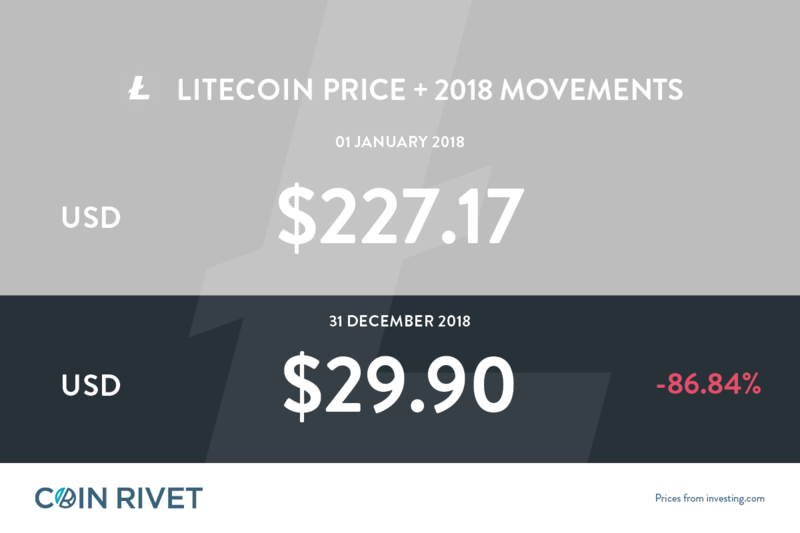 The price of Litecoin (LTC) dropped 86.84% since it opened at $227.17 on January 1st, 2018. It closed on December 31st, 2018 at $29.90. Despite the dramatic loss of price in 2018, LTC is still one of the biggest, most well known, and most widely traded cryptocurrencies around. It is one of the top 10 cryptocurrencies by market capitalisation. Litecoin was released in October 2011 by Charlie Lee, a former Google employee. It was a fork of Bitcoin, with the main difference being a smaller block generation time, increased maximum number of coins, and a different Script-based algorithm. Our site is packed full of content and resources if you want to find out more in-depth information about cryptocurrencies.